It's time for us to start cutting our Valentines Day projects. 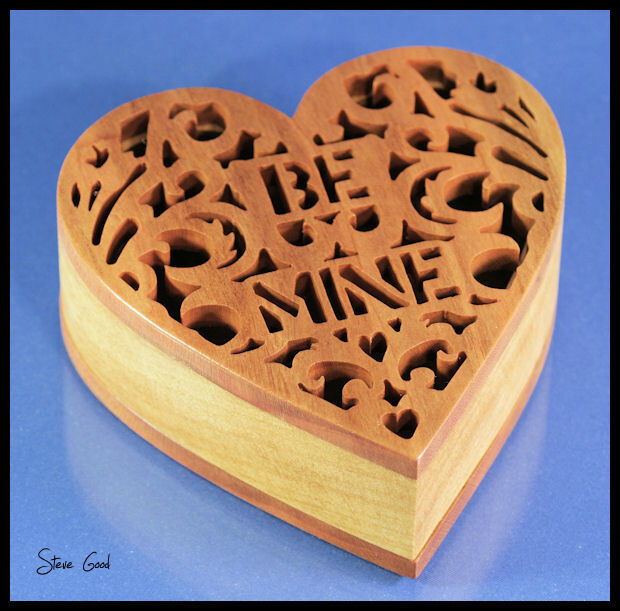 This little fretwork heart box is cut from 1" thick Canary wood for the walls and 1/4" thick Cherry for the top and bottom. The box is only 4" x 4" so it does not require much wood. I hope everyone had a great New Years Day. Thanks for all the kind email wishing my family a nice holiday. 2010 was a great year for the Scrollsaw Workshop blog. The blog continues to grow and I hope each of you are enjoying the content. I will try my best to keep things interesting in the coming year. There are opportunities for me to improve things here and I will try to do just that. This year it became a big challenge to keep up with the email and keep my hand in the Community forum. I want to improve both of these issues. I also have other additions planned for the blog so stay tuned and let's all enjoy our hobby in 2011. Thanks to each and everyone of you for making 2010 so much fun for me. I have a blast working on the blog and the payoff is seeing so many of you enjoy it.